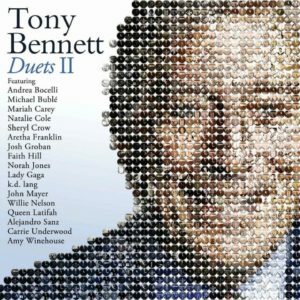 Tony Bennett & Carrie Underwood Sing Magical “It Had To Be You” Duet. Tony Bennett’s singing career has spanned multiple decades, so it stands to reason that the music mogul would approach some of the old greats in the industry when he’s looking for someone to partner up with for a duet. But Bennett isn’t above joining forces with the younger set and we’re all grateful for that! His “Duets II” album, released in the fall of 2011, included numbers with everybody from Mariah Carey and Cheryl Crow to Michael Bublé and John Mayer. But one of the standouts on the list is none other than one of our favorite country singers, Carrie Underwood! She not only joined the big band crooner for a duet of a nearly century-old song covered by some of the greatest singers of all time, but even helped get the word out about the upcoming album just before it was released in September. The two musical giants made a cameo appearance on the season premiere of “Blue Bloods” that July, performing “It Had To Be You” at a fundraiser attended by Frank (Tom Selleck) and Erin (Bridget Moynahan). “Tony and I recorded that for his 85th birthday album,” she says as the audience continues to clap. Tony starts to sing in his characteristic velvety tone that elicits all the warm and fuzzies. When Carrie’s crystal-clear voice comes in moments later, though, the combination of their talents is unmatched and unexpected. The two legends trade vocals throughout the song, and it’s nothing short of magical. This duet is truly a work of art that you have to hear to appreciate! Check it out in the video below, and share to spread amazement! Twin Serves As Surrogate For Sister Who Can’t Get Pregnant & Their Bond Is So Inspiring. After Teacher Said He Was Too Fat To Dance, Hilarious Teen Wins Golden Buzzer. Cop Pulls Man Over But Instead Of Giving Him Ticket He Gives Him A Ride. Someone Said Nurses Spend Their Time Playing Cards — Let Me Tell You What Nursing Is. 10-Yr-Old Gymnast With Prosthetic Leg Stuns Millions With Incredible Stunts. Shy 17-Yr-Old Singer Steals Spotlight From Michael Bublé At His Biggest Concert. NSYNC Joins Ariana Grande For Performance That Has Fans Of All Ages Screaming.